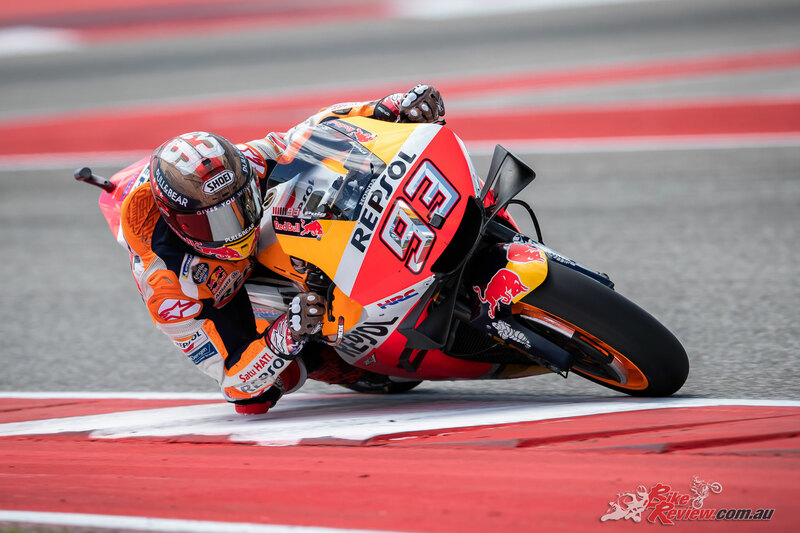 Marc Marquez secured a seventh straight pole position at the Red Bull Grand Prix of the Americas after setting a 2:03.787, but the King of COTA has company: Valentino Rossi was only a couple of tenths in arrears in second, with Cal Crutchlow completing the front row in Texas. 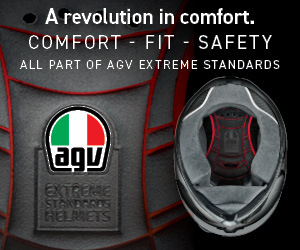 The mission for those just behind the reigning Champion is simple: stop Marquez. After inclement weather throughout the morning in Austin and FP3s getting cancelled, it was thankfully back to beautiful blue skies above the Circuit of the Americas for qualifying. Normal service was resumed at the beginning of Q2 as Marquez took to the top and slammed in a 2:03.787 straight out the gate, chasing down teammate Jorge Lorenzo – who topped the timesheets in Q1 – to put in the best time of the weekend, but drama was about to hit the number 99’s side of the box. A mechanical issue left Lorenzo parking his Honda near the end of pitlane in a scene reminiscent of his teammate’s antics at the track a few years ago as he ran back to the garage. Marquez’ time seemed well out of reach initially, meanwhile, as Maverick Viñales was a full two seconds back before his teammate Rossi jumped up to second, 0.733 off. 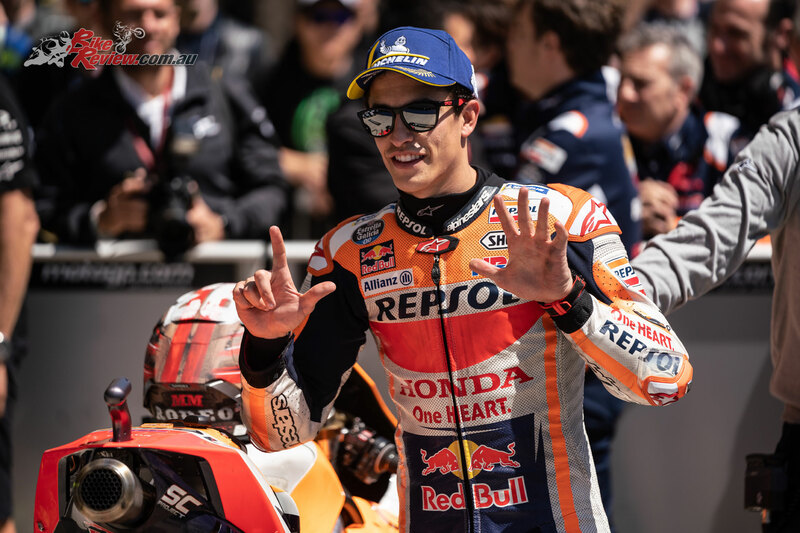 No one could get closer than that to Marquez after the first runs, with Rossi emerging as best of the rest ahead of Jack Miller, Viñales, Alex Rins and Crutchlow. But there was more to come. Second time lucky it wasn’t for the reigning Champion, with Marquez unable to better his time but the rest inching closer and the possibility seemingly so close. 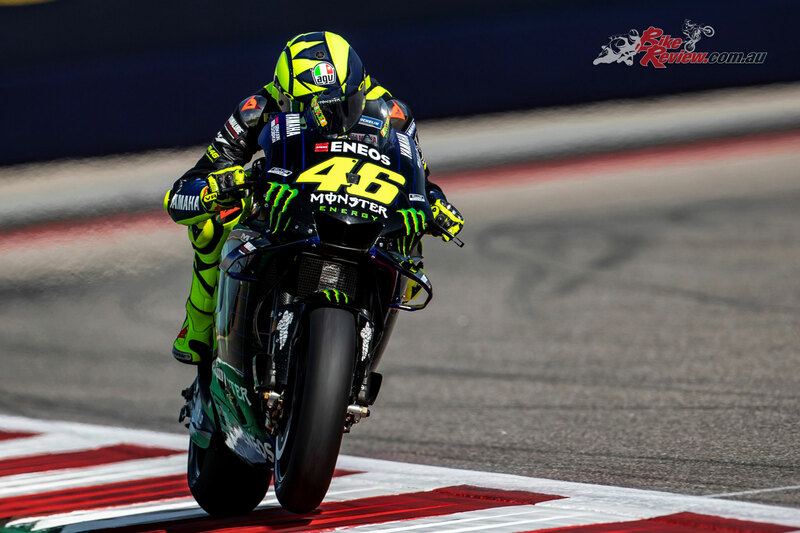 Closest of all was Rossi, who managed to cut the gap to under three tenths, with Crutchlow then taking over in third but less than a tenth off the ‘Doctor’. 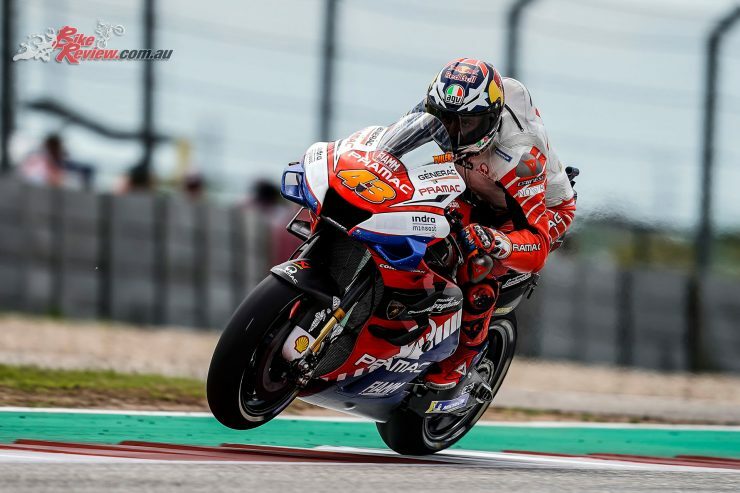 Miller heads up Row 2 as he took top Ducati honours in P4, with another spectacular performance just behind the Australian in fifth: a certain Pol Espargaro, who took the best result for Red Bull KTM Factory Racing in the premier class. Just 0.685 from pole, the Spaniard was visibly delighted crossing the line. Viñales, meanwhile, improved on his last lap to grab a second row start in P6, and he’ll be aiming for a lightning start on Sunday. 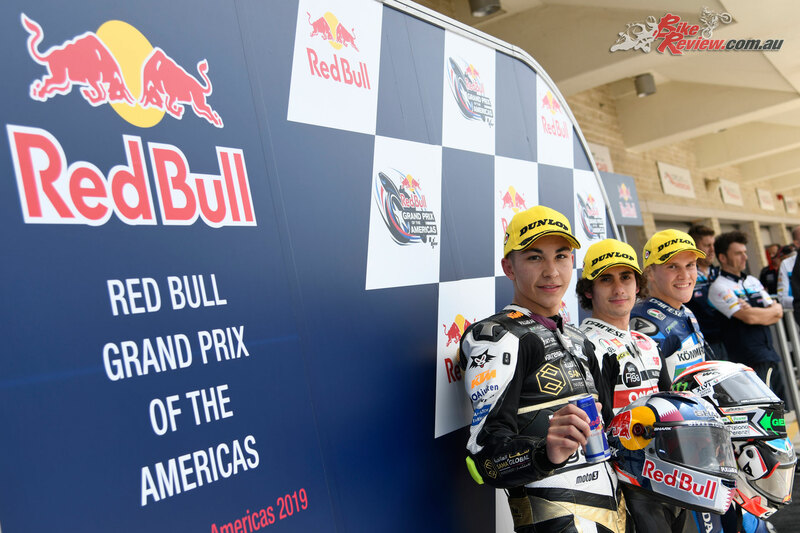 Dynavolt Intact GP’s Marcel Schrötter followed up his Friday form with more Moto2 dominance at the Red Bull Grand Prix of the Americas as the German backed up his top spot finishes in both of yesterday’s sessions to bag a second pole position of the season. It was close though, with a best effort of 2:10.875 just 0.058 ahead of the second fastest man: Alex Marquez. 2015 Americas GP winner Sam Lowes completes the front row, his fourth consecutive front row start at the track in the intermediate class. 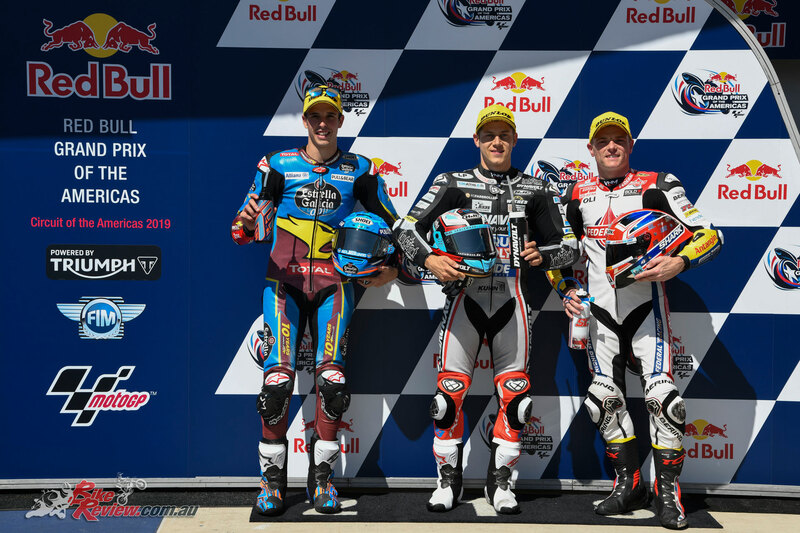 After it was Dynavolt Intact GP’s day on Friday, it wasn’t quite a dream 1-2 in qualifying as veteran Tom Lüthi was pushed back onto the second row of the grid, but he’s close to the front and joined there by Red Bull KTM Ajo’s Brad Binder in P5. 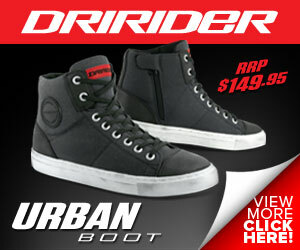 The South African made it through from Q1 earlier in the day after a more difficult Friday. That wasn’t true of Jorge Navarro after the Spaniard had some top pace on Friday, and he completes Row 2. 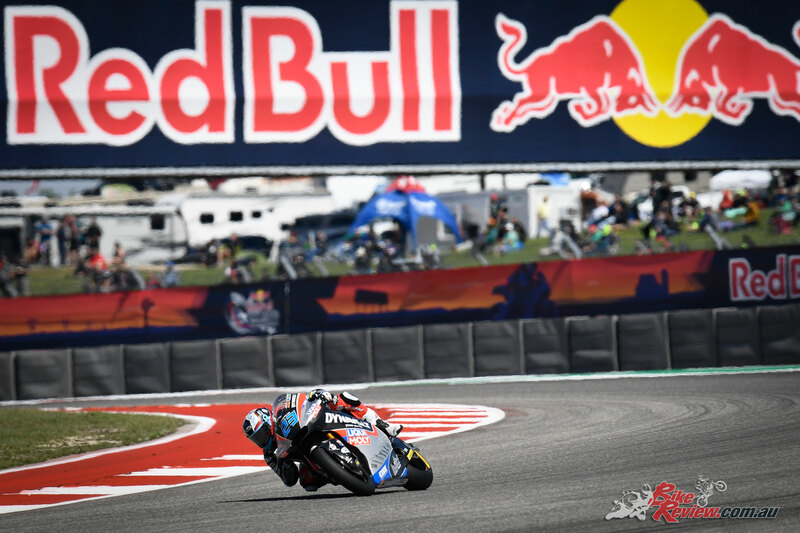 On his return to the Moto2 class, Mattia Pasini ended the session an impressive seventh, with Red Bull KTM Ajo’s rookie Jorge Martin securing a career best Moto2 qualifying in eighth, 0.033 seconds ahead of Simone Corsi who rounds out the third row. Sky Racing Team VR46’s Luca Marini completes the top ten, with a few surprise names missing: Championship leader Lorenzo Baldassarri starts P15, Argentina podium finisher Remy Gardner (ONEXOX TKKR SAG Team) from P18 after a crash and Argentina polesitter Xavi Vierge from P20. 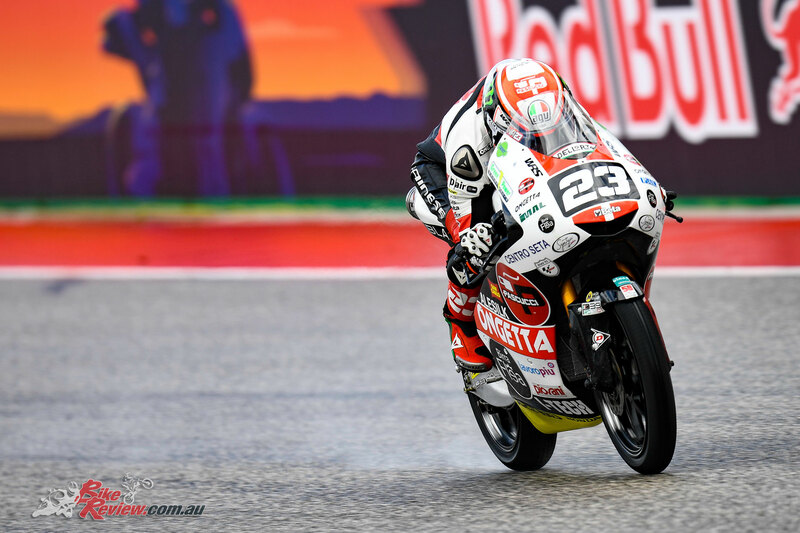 Niccolo Antonelli has taken his first pole position since Qatar 2018 in qualifying at the Red Bull Grand Prix of the Americas, brave in tough conditions to pull half a second clear of a stunning performance from rookie Raul Fernandez in second. Fernandez moved through from a wet Q1 and leapt up the timesheets on his final flying lap to take his first ever front row start, 0.282 ahead of Gabriel Rodrigo in third. With rain causing FP3 for all classes to be cancelled, it was straight into qualifying for Moto3 and Q1 saw some high rates of attrition. 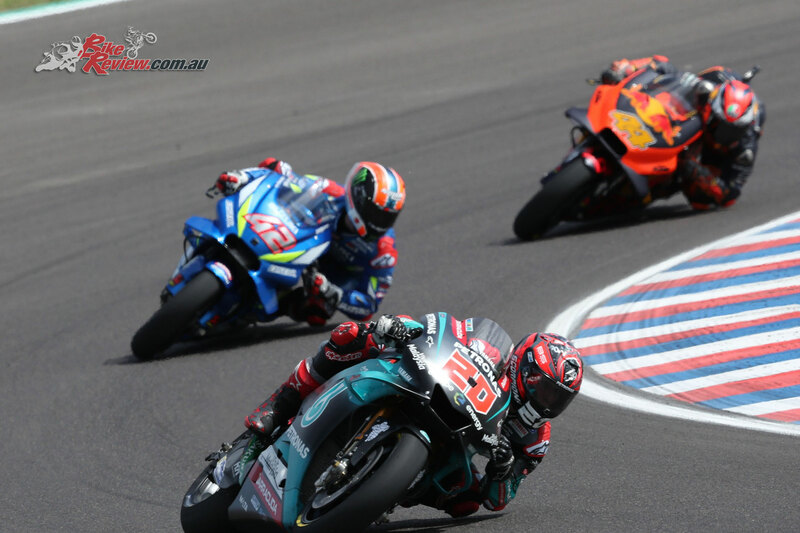 As conditions gradually improved throughout Q2, however, laptimes were tumbling rather than riders and much of the grid set their fastest lap on their final attempt. That wasn’t true of Antonelli though; the Italian setting his benchmark on lap five of six and remaining unthreatened on pole despite the best efforts of the rest. Behind the two at the top it was close competition for the front row, however, with Q1 graduate Jaume Masia taking fourth but only 0.015 off Rodrigo, ahead of another rider who moved through from the first qualifying session – Darryn Binder, who was the pacesetter for much of the session until the final push. Aron Canet completes Row 2 despite a late crash in Q2. Tatsuki Suzuki was another who found himself losing out on a row of the grid by a tiny margin, with the Japanese rider pushed off the second row by less than a tenth and instead starting seventh. He’s just 0.065 ahead of John McPhee, with Alonso Lopez three tenths off in P9. Marcos Ramirez completes the top ten, just ahead of teammate Lorenzo Dalla Porta despite a crash for the Italian. 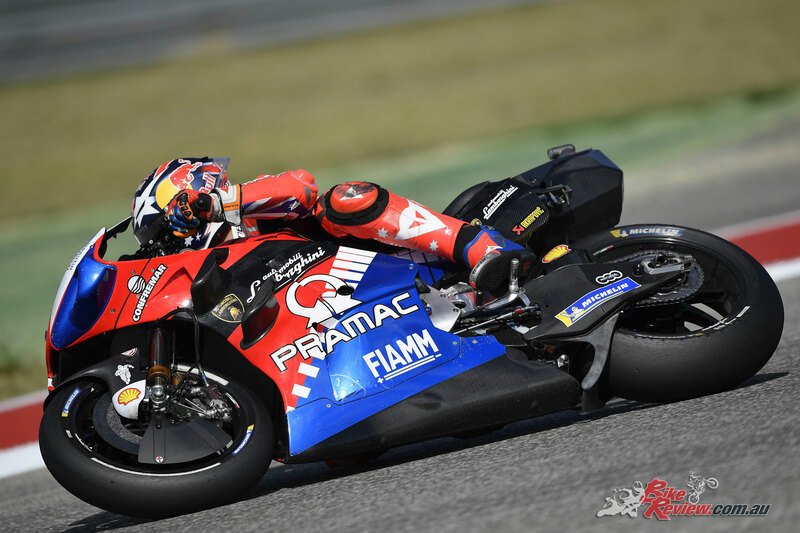 Two-time Texas winner Romano Fenati, meanwhile, faces a bit of a fight back from P12 on the grid – and is sure to prove one to watch once the lights go out. 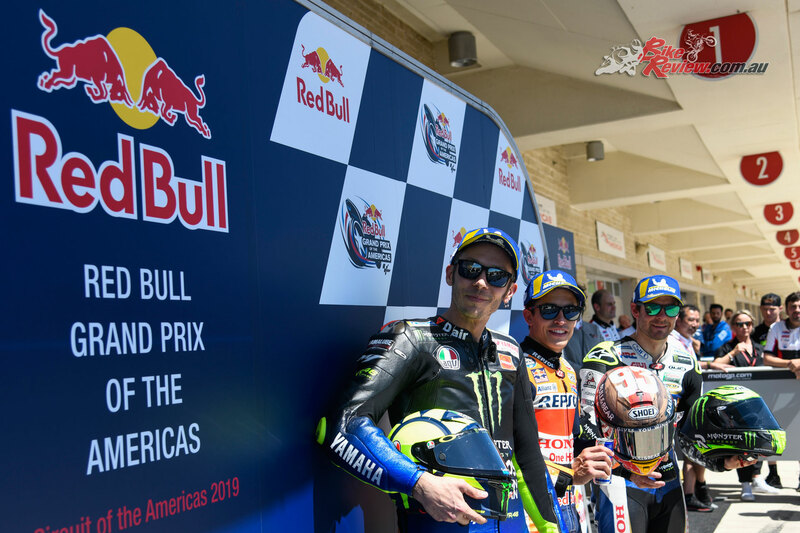 That’s at 11:00 local time (GMT -5) on Sunday as Fenati shoots for a hat trick – and everyone else fights for a first Americas GP win.